Call 800-786-2289 (Pacific Time Zone) or email betty@sunrise-trees.com for Prices. Quantites of 500 or more receive a discount. Biodiversity: Protect and promote biodiversity. Performance measures include protecting natural features, water ways, fish and wildlife habitat and ensure that workers and equipment minimize harm to biodiversity. Sunrise Tree Farm recognized this need decades ago and began planting along our creeks to protect the soils there and provide a natural area for wildlife. In 2006 we set aside 20 acres along our waterways and widened and fattened out these older plantings. Soil and Water Resources : Actively involved in long-term conservation of soil and water resources. Performance measures include utilizing soil erosion prevention practices and implementing protective measures to mitigate potential negative impact of farm activities on water quality. This is the heart of where we started when we began to farm. When our farm was leased out in the late 60’s, on a stretch of road going up our hill, we would see a fairly smooth road in the summer, but two deep ruts running down the hill in the winter. When we put that picture together with the subsoil we could see at the top of the hill, it was clear we had no soil to lose. We decided our first obligation to the farm was to leave it in better shape than we found it. Our ground cover rows between the rows of trees sent us in a different direction from most Christmas tree farms. It was the right thing for our farm and we have been using ground covers since 1975. Community and Consumer Relations: Active in the community and with industry groups in fostering farm stewardship and environmental education. Performance measures include involvement with community and industry organizations to preserve, protect and conserve natural resources. Promote environmental and sustainability education. Betty worked with other growers and retailers through the Northwest Christmas Tree Association in the 1980’s to create a consumer tree care brochure that is still sold through the association. She also developed a brochure for cold climates and warm climates for retailers on how to handle northwest trees. She was involved with a group that produced a notebook with which new retailers could get started. With the creation of the Christmas Tree Promotion Board in 2015, Betty is helping to promote Christmas trees as well as develop customer tree care information that can be used across the country through fire departments. We recycle everything possible on our farm from metals to kitchen compost. All our used oil is recycled to someone who uses it for heating. Our passive solar house we built in 1980 has been very efficient and comfortable. Sunrise Tree Farm has been certified as a “Socially and Environmentally Responsible Farm” (SERF) since 2011. 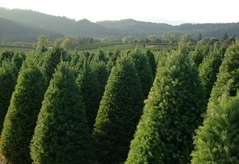 We are one of five Christmas tree farms in the state of Oregon inspected by the Oregon Department of Agriculture (ODA) and certified through the Pacific Northwest Christmas Tree Association (PNWCTA) for our work with ground covers, integrated pest management and our contributions to teaching about the environment and sustainability. To be certified we quantified our work in a sustainability plan. We were then assessed in five areas: the bio-diversity of our farm, how we care for their soil and water, our integrated pest management program, the health and safety of our employees and our contributions to foster farm stewardship and environmental education. Each area was scored on four to six conformance goals. It was necessary to score in all areas to be able to be certified. When Pat and Betty started Sunrise Tree Farm they saw the erosion taking place on their land from the previous manager. In an unusual move in the Oregon industry, they decided to maintain a ground cover strip between each row of Christmas trees. The ground cover not only protected their soil and water, but ended up being a place for predatory insects and became the basis for their integrated pest management system. In 1987 they received an award for their ground cover work from the Benton County Soil and Water Conservation District as an “Outstanding Cooperator”. In order for a certification program to be creditable, third party standard development and audit of standards is crucial. From concept to pilot program, it took four years and dozens of growers along with the ODA, Oregon State University (OSU) Extension Service, representatives from labor and environmentalists working on the third party standards development. With ODA as the inspector, this program also has a third party auditor of the standards. 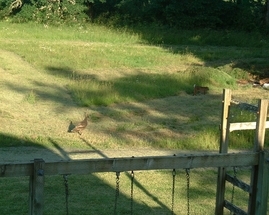 Momma Turkey and the Bobcat in our front yard. Integrated Pest Management (IPM): Utilizes appropriate IPM techniques to control insects, weeds, diseases and other pests. Performance measures include training in IPM systems and providing evidence of utilizing IPM in decisions and actions. We have been utilizing integrated pest management since we became involved in the farm in 1975. We had not heard of the term “integrated pest management” then. No one taught us. We didn’t want to use any chemicals at all when we started. We then realized that it was easier to be philosophically pure if you didn’t do anything. We came to appreciate chemicals as tools to be used sparingly, targeted and only if the economic consequences demanded it. This goes back to our vision of leaving the farm in better shape than we found it: 40 acres of thistle and blackberry and erosion evident. We resolved to use pesticides with the least impact, if we had to use any. Health and Safety: Create a safe environment for all workers. Performance measures include health and safety training for employees. Risks on the farm are evaluated and training practices are updated to reduce risks. In the mid 1980’s Betty ran across this saying as a volunteer firefighter for Hoskins-Kings Valley Rural Fire Department: “No job is so important or service so urgent that we cannot take time to do our work safely.” We work with our employees to make our farm as safe as possible. An employee saw a loading platform for the back of 53' semi trucks at another farm. At his suggestion we had one built. It was the best idea ever!